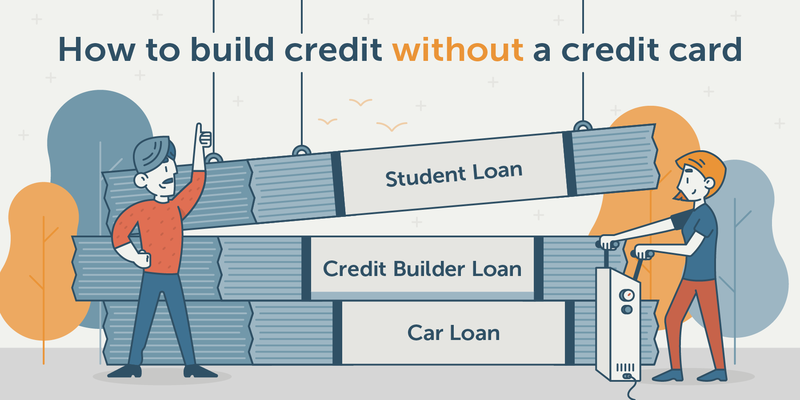 Building credit can be frustrating, especially when the credit industry is not set up in your favor. Since credit reporting agencies incentivize large spending and lending habits for those just starting to build credit, establishing a positive credit score can take time. Luckily, by using some inside knowledge of how credit reporting agencies work you can get past the gap by establishing positive lending practices. Whether you need to establish a credit score from scratch or need to improve your credit score, use this guide to lead you towards your goals. If you went to check your credit score or credit history and did not find any results, you are part of the 1 in 10 adults that are credit-invisible. For the 26 million Americans who are credit-invisible, it can be difficult to apply for most loans, leases and credit cards. However, not having a score does not prevent you from establishing credit. The first step to obtaining a credit score is to establish a credit lending history. If you are starting out without any credit or lending history, there is a market of lending options for you. Although these choices do not come with perks and incentives that top credit cards come with, they are an opportunity to build credit quickly. A secured credit card is a way to build a credit history without any of the risks that come with borrowing a sum of money. A secured credit card will use a deposited sum of money to act as collateral for a line of credit. Most secured credit cards require at least a $200 deposit and depending on the lender there may be an annual fee. It is crucial to pay off any outstanding payments on time because secured credit cards have a high purchase annual percentage rate for any amount overdue. Use a secured credit card as you would a debit card, only make purchases you know you have sufficient funds to afford. Student credit cards are designed for college level students over the age of 18. Student credit cards may require a minimum credit score in order to apply but the requirements are designed for the student in mind. With low annual percentage rates and competitive rewards programs, these cards are a great way to build credit if you are just starting out. Store credit cards are an option that some businesses offer to finance in-store purchases and even general purchases. Store credit cards often have a low or no credit score requirement making them a great option for someone starting out without any credit. Store credit cards are best used for grocers and any other place where you shop frequently for necessities. A cosigner can be used when applying for a credit card if you do not have sufficient funds, are under the age of 21 or do not have a credit history on your own standing. The cosigner will act as a responsible party vouching that if any funds are due to the lender, they are accountable to pay the debt. Ask your parent or guardian if they are comfortable becoming your credit card cosigner. Credit card companies allow the card owner to set up authorized users under the account. An authorized user is not accountable to pay debts or fees but can make charges onto the card. 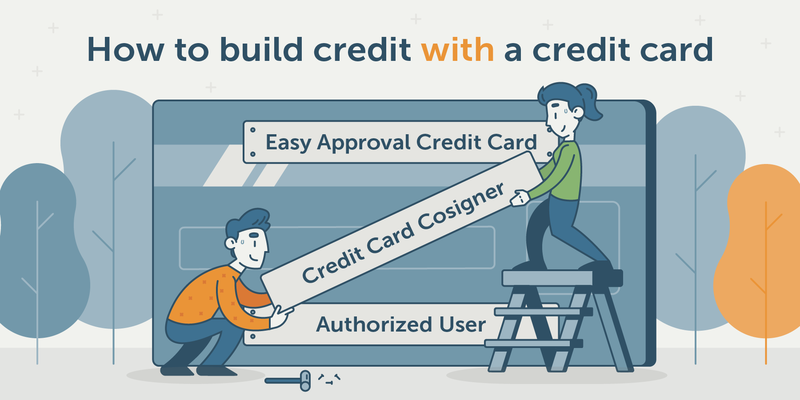 As an authorized user your name will begin to show on the credit history for the specific credit card account and in turn, you will begin to build credit. Because an authorized user is not fully accountable to repay debts, it is helpful to ask a parent or guardian if you can be listed as an authorized user. Becoming an authorized user will give you a standing as being listed by the credit bureau, but you may not build significant history to aggregate a credit score. Credit cards may be the most common way to build credit, but they come with heavier responsibilities and repercussions of high annual percentage rates. As a credit score is calculated using your total lines of credit and lending history, there are other steps to take to build credit without using a credit card. Credit builder loans are designed specifically for new lenders in mind and are a method to establish a positive lending history. Banks, credit unions and self-lending companies offer small loans of around $1,000 as a way to establish credit. When the loan is taken out you will be expected to pay it back over a period of 6 to 12 months. During the term of your loan, you will need to make payments on time in order to receive a positive credit score. Any loan will count towards your credit score so if you are planning on a large purchase or expense you can negotiate a loan. If you are starting without any credit a lender may ask you to place collateral or to get a loan cosigner. Getting a cosigner is common for student and car loans as they are typically a hefty investment. Student loans may have a payback period of over 10 years and will begin to build credit when you start to pay off the loan. Car loans have a shorter payback period and typically start to show on your credit score quicker. Keep in mind to make your payments on time and in full, this is the key to building a great credit score. 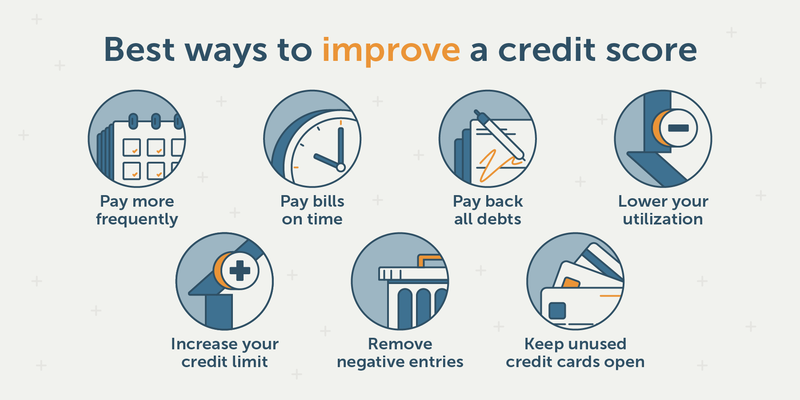 Once you already have a credit history, improving your credit can be a little more difficult. Your credit score is carefully calculated using metrics of your lending and payment history, transactions, types of credits and total amounts owed. Luckily with careful planning and some budgeting best practices, you can quickly bring your credit score towards an upwards trend. Paying off your credit more frequently can have a positive effect on your credit score as it will keep your credit utilization low and help you stay ahead of large debts. More frequent payments also give a higher number total payments for your credit score to be calculated from. Paying your bills more frequently is a longer-term investment and will have a positive effect on your credit score in months rather than weeks. Keeping up to date on your card payments has the most impact on improving your credit score over time. Payment history is the top-most weighted metric in your FICO score and weighs heavily into your overall credit. If you struggle to make full payments, making the minimum payments will not negatively affect your credit score. Paying back any outstanding debt can have a positive and a negative impact on your credit score. Paying your debt off earlier than expected and paying off debt later than expected will both negatively affect your credit score. Credit companies incentivize sticking to your financial plan and place a positive credit score on paying your debts back on time. Paying back debts before or after the due date is a sign that the borrower should have taken out credit with a different timeline. Closing out old and unused credit cards is not ideal and could negatively affect your credit by raising your credit utilization and shortening your lending history. If your credit card has any fees or minimum usages required you should still close the account despite the impact of your credit score. Credit utilization is the percent of funds you usually borrow compared to your total credit limit. Your average credit utilization is a major factor of your credit score as it determines if your spending habits on the card are close to your total limit. An Ideal credit utilization is 30 percent or under, which is low for many starting out with a new credit card. It is important to keep your credit utilization low as frequently hitting your limit will negatively affect your credit score. If you find yourself nearing your credit limit between each payment, you should ask for your credit card provider to raise your limit. When you reach out to your credit card provider to raise your credit limit, be sure to have first paid off any balances or bills due on the card. Credit card companies will look into your account before deciding to raise your credit limit and can deny a request if you have outstanding balances, frequently miss payments or pay frequently pay only the minimum balance. Negative credit entries like hard inquiries, late payment charges, reporting mistakes and even delinquencies can all be removed from your credit given some stipulations. Removing a negative credit entry is one of the quickest ways to improve your credit score as updates are typically handled within the 30-day period in which credit reporting agencies are updated. To best understand how to improve your credit score it is important to look at how your credit score is calculated. 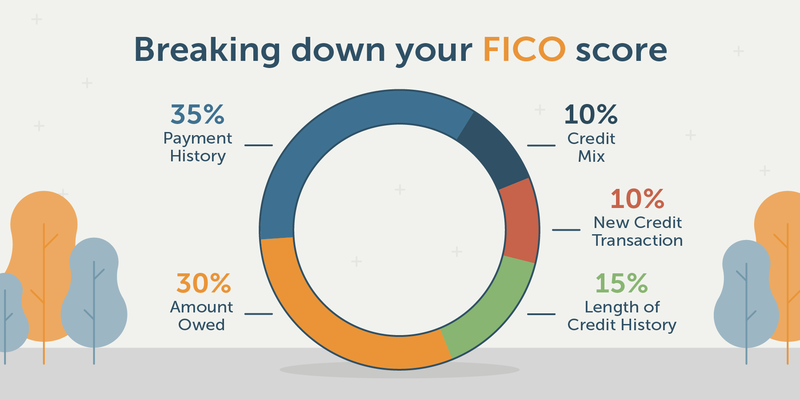 Your FICO score is calculated using data reported by the major credit reporting agencies and is used by lenders to determine risk and eligibility for lending. Payment history is the most important value which carries a 35 percent weight in your overall credit score. Payment history will have a positive effect on your credit score if you make your payments on time and in full. Payment history will have a negative effect on your credit score if you carry over balances, are late or default on payments. Your total amount owed accounts for 30 percent of how your credit score is calculated and consists of both good and bad debt. Good debt is allowances you are paying off and paying down over time. Just because you have an outstanding debt does it mean you will have a negative score. Bad debt in the case of amounts owed would be outstanding credits you are not paying off the minimum payments on. How long you have been listed as a lender accounts for 15 percent of your overall credit score. The length of your credit history adds more certainty to your overall credit score as it is more likely that if you have established past good behaviour with lending that you will continue. A long lasting bad credit history will have a negative impact on your credit score and this factor can end up significantly lowering your score. Your newest transactions account for 10 percent of your overall credit score and are weighed higher than you overall transactions. Many credit score raising hacks like taking out another credit card or loan can cause your credit score to rise, but the benefits are short term. New credit transactions are constantly revolving and is updated in 30-day cycles. Your credit mix is the diversity of your overall credit or lending history and accounts for 10 percent of your overall score. Your credit mix is scored by the number of different types of credit you have outstanding and used in the past. Student loans, car loans, credit cards, mortgages and any other formal lending will add to this score. Negative credit report entries consist of late payments, delinquencies, charge-offs, overdrafts and a variety of other negative lending practices. Another avenue to raising your credit score is through credit repair services that remove negative entries from your credit history.